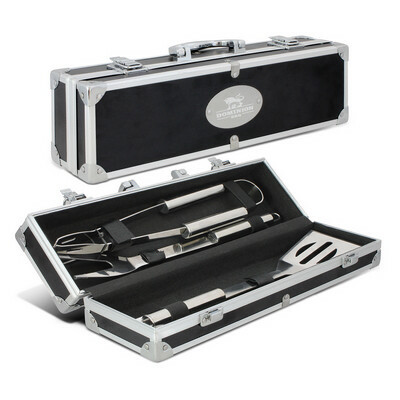 Durable barbeque set in a 600D polyester case. It includes a fork, a pair of tongs and a spatula, all of which are manufactured from non stick food grade stainless steel. Colours: Case: Black. Dimension: L 400mm x W 120mm. Print Description: Case: 207mm x 40mm (one colour). Print Type: Screen Print. Packing: Loose packed. Premium barbeque gift set in a superb metal and plastic presentation case. It includes a fork, a pair of tongs and a spatula, all of which are manufactured from non stick food grade stainless steel. Colours: Case: Black/Silver. Dimension: L 372mm x W 78mm x 98mm. Print Description: Case: 60mm x 20mm. Print Type: Pad Print. Packing: Gift case. Description: Stainless steel BBQ utensils with rubber grip handles for easy use. Features: The aluminium case is supplied with a metal badge suitable for decorating, Includes spatula, fork and tongs. Packaging: Plain white tuck box. Packaging Size: 461mm(h) x 145mm(w) x 86mm(d). Colour: Silver. Material: Case: Aluminium. Tools: Stainless steel with rubber grip. Product Size: Case: 460mm(w) x 130mm(h) x 80mm(d). Decoration: Pad Print, Engrave. Decoration Area: On Badge - Laser: 30mm(w) x 20mm(h), Pad: 40mm(w) x 20mm(h). 3-pcs stainless steel BBQ tool set includes a 35cm spatula, fork and tongs. 1680D Polyester foam cell lined sling carry bag with red contrast lining. Quick stash front slip pocket. Heritage loop badge on front. Antique brass hardware and accessories. Adjustable shoulder strap. po ‘di fame side pip. Description: 3pcs Stainless steel BBQ utensils. 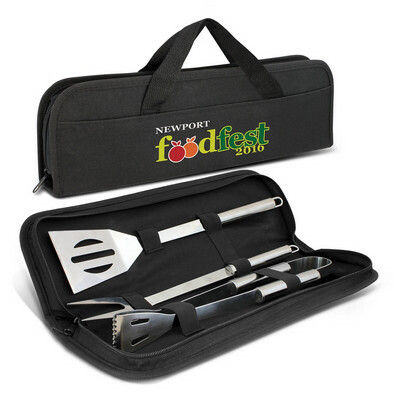 Features: Supplied with black 600D woven polyester carry bag, Includes spatula, fork and tongs. Packaging: Carry bag has is presented in a white tuck box with the utensils are packed in individual polybags. Box size: 430mm(w) x 105mm(h) x 57mm(d). Colour: Black. Material: 600D Polyester. Product Size: Case: 420mm(w) x 280mm(h). Decoration: Pad Print, Screen Print, Engrave. Decoration Area: Screen: 120mm(w) x 180mm(h).